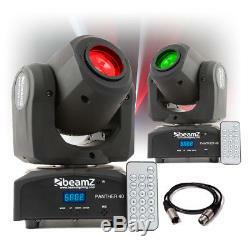 Panther 40 LED Spot Light IR DMX Moving Head Gobo DJ Disco Stage Lighting (Pair). Built with your needs in mind, this package is bought to you by Electromarket. Package Includes 2x BeamZ Panther 40 Moving Head 1x PD Connex DMX Lead 1.5m. 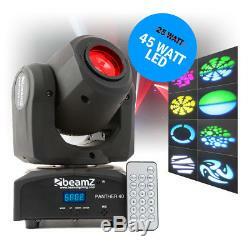 FFA2364 - BeamZ Panther 40 LED Spot Light IR DMX Moving Head Gobo DJ Disco Stage Lighting. A very compact Panther moving head with bright output. The 45W LED produces a 12 degree beam. The moving head is equipped with a colour and gobo wheel for ultimate control. The gobo wheel has 7 different gobos + open and the colour wheel has 7 colours + white. This Panther moving head works in DMX, stand-alone mode or with IR control. When operating in DMX mode you can choose 3 different DMX channels modes. Main Features Single white 45W LED 5, 9 or 11 DMX channels 7 pre-programmed shows IR remote control. 5, 9 or 11 DMX channels for DMX and Stand-alone mode. 7 Gobos with gobo shake effect or open beam. Sound activated with adjustable sensitivity. Auto mode with adjustable speed. DMX in-/output via 3-pin XLR. Head movement - Pan: 540 degrees. Head movement - Tilt: 200 degrees. Of colours: 7 Colors + white. Of gobos: 7 fixed Gobo's + open. Of LEDs: 1 x 45W. DMX channels: 5, 9 or 11. Dimensions: 145 x 172 x 240mm. JJA1389 - PD Connex Male XLR to Female XLR 1.5m. 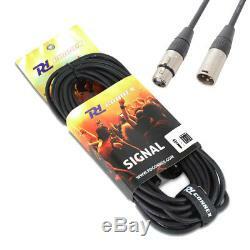 A 3 pin XLR plug to 3 pin XLR socket lead. This is a twisted shielded, accurate noise free control cable for DMX control or master / slave connection of lighting effects. 3-pin XLR plug to 3-pin XLR socket. For DMX-control or master/slave connection. A tracked service is available when you select a 48 hour or 24 hour courier service. Due to our carriers charging extra for Highland and Islands, we need to pass this charge onto our customers. Where do you deliver to? We deliver to the UK, Ireland and internationally covering most of the EU, including. All deliveries will require a signature so please ensure someone is present to sign for the item. The couriers will try and deliver the item twice before returning the item to us. Sound and lighting equipment can be very technical, and there are some simple practices to avoid unintentional damage to your equipment. Our goal is for your equipment to last as long as possible, so we are always on hand to give free advice about how best to use your equipment to prevent user error. The actions from here can range from a charged repair, replacement or upgrade. How do I find the item number or product code? The product code of the item is displayed in orange text to the right hand side of the main image in the description. It will be displayed as a seven-figure code e. Can I amend my order? Before dispatch: you can amend your order, or cancel your order at any time. What if I have not received my order? What if the item(s) received are faulty or damaged? Please note that a cheque transfer may take up to 10 days to process, however. When will I receive confirmation of my order? Will you accept offers on price? All of our listings are given a non-negotiable, fixed price. However, If the item is B-stock, clearance or damaged we may accept offers on price. Please check the listing for details. Can I come in store and collect my item(s)? Sorry - we do not accept reservations on items. If you have any enquiries, concerns or questions about your order, our policies or any of our products: our friendly customer service and sales team are on hand to assist you with anything you may require. We are open 6 days a week, excluding bank or public holidays & annual holidays. The item "Panther 40 LED Spot Light IR DMX Moving Head Gobo DJ Disco Stage Lighting (Pair)" is in sale since Thursday, December 22, 2016. This item is in the category "Sound & Vision\Performance & DJ Equipment\Stage Lighting & Effects\DJ Lighting Systems & Kits". The seller is "electroxtra" and is located in Thurrock, Essex. This item can be shipped to European Union member countries.